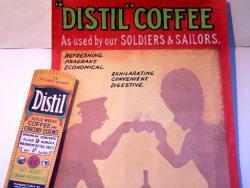 WW1 Reenactments Equipment : Great War Tommy WW1 Food Rations Labels : Distil Coffee & Chicory Essence - Boer War. WW1 Reproductions and WW1 Reenactors Equipment / Kit - Distil Coffee & Chicory Essence - Boer War. "Distil" Coffee & Chicory Essence - Boer War. Founded in 1889 by Beare, Gosnell & Fry of Southwark, London, This award -winning essence was sent to troops in the Anglo-Boer War. See poster in 'Gallery' section. and the company was taken over just after the Great War.